It turns out that finding a gray hair in the sink isn’t just a sign of an imminent mid-life crisis. Researchers from Cairo University in Egypt and the European Society of Cardiology have now linked graying hair to an increased risk of heart disease in men. Dr. Irini Samuel explains that graying hair indicates more than simple aging – it shows that the body is at increased risk of atherosclerosis, a condition defined by the hardening and narrowing of arteries that interrupts blood flow and increases cardiovascular risks. "Atherosclerosis and hair greying occur through similar biological pathways and the incidence of both increases with age. Our findings suggest that, irrespective of chronological age, hair greying indicates biological age and could be a warning sign of increased cardiovascular risk," she said. The observational study included 545 adult male participants who underwent multi-slice computed tomography (CT) and coronary angiography tests. Participants were divided into one of five groups based on the presence or absence of coronary artery disease and the amount of gray/white hair they had. Five distributions of hair color designated the hair color groupings. Group one had no gray or white hairs; group 2 had more naturally colored hair than gray/white hairs; group three had equal amounts of gray/white and natural hair; group 4 had more gray/white hair than natural hair; and group five had pure gray/white hair. After collecting data and analyzing the results, the researchers found that participants in groups 3, 4, and 5 were more likely to have coronary artery disease, regardless of their chronological age. Further, the researchers said that higher proportions of gray/white hair correlated with higher coronary artery calcification. 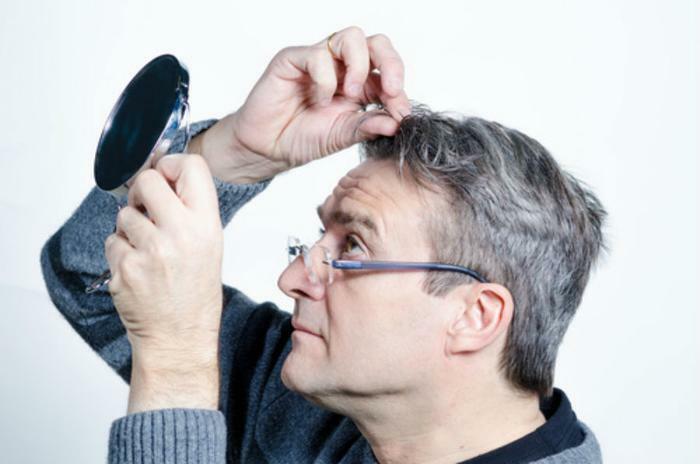 The researchers make clear that age is an “unavoidable coronary risk factor,” but their findings suggest that graying hair could be an early indicator of advanced biological age. Through further study, they say that eventually medical professionals could use these physical signs to provide early intervention for cardiovascular disease. "Further research is needed, in coordination with dermatologists, to learn more about the causative genetic and possible avoidable environmental factors that determine hair whitening. A larger study including men and women is required to confirm the association between hair greying and cardiovascular disease in patients without other known cardiovascular risk factors," said Samuel. The results of the study were presented at EuroPrevent 2017.